Description: An WB intermodal screams thru Stoddard behind a very clean "warbonnet" - NICE! 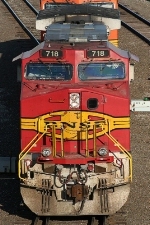 Description: BNSF Eastbound Intermodal Train at Summit, Ca. Description: NS 38G on the 202 track at Abrams Yard ready to work with a clean BNSF leading. Description: BNSF 718 leads an intermodal through Joliet Union Station. Description: An ugly day. Just north of the big paper mill in Sartell. It would be a good spot on a nice day. Description: Memphis, TN to Barstow, CA manifest train H-MEMBAR1-20A in Abo Canyon. Title: A trio of Dash 9s, 4605, 4435, and 718, lead an eastbound. 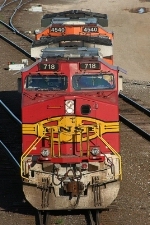 Title: The Warbonnet remains on BNSF C44-9W 718 as it, and sister 4435, are trailing units on an eastbound. Description: BNSF 718 leads two others elephant style around the T Yard via the North Runner. Description: Eastbound grain loads pass alongside what will soon be the site of a realigned four-lane U.S. Highway 10 in Detroit Lakes. The building seen on the left is the former Northern Pacific depot and is still served daily by Amtrak's Empire Builder. Description: BNSF Eastbound Doublestack Train S- CLOMEM ( Clovis, NM to Memphis, Tn. ) passing through Neosho, Mo. Title: Fake-Bonnet on the fuel racks at Havre. Description: A pair of warbonnets lead a auto train through Naperville at a slow pace.